Harvard University is a private university located in Cambridge, Massachusetts, about three miles west of MIT. It ranked #1 in US News's 2009 "National Universities: Top Schools" list, and is usually ranked either first or second in most lists of a similar nature. Founded in 1636 (as "New College" at Cambridge; the school renamed itself "Harvard College" in 1639. ), it is the oldest institution of higher learning in the United States. It was originally founded by Congregationalists for the purpose of training ministers. Harvard is one of the eight schools in the Ivy League. Harvard accepts applications from homeschooled children. The Harvard University libraries contain more than 16 million volumes and is the largest and most important academic library in the world. It began in the 1638 bequest of 400 books from John Harvard (a young clergyman; the University was named after him). The core of the University's collections is found in Widener Library, but there are 70 libraries in all. It is renowned for special collections of incunabula, law, anthropology, East Asian studies, Slavic studies, Hebraica and Judaica, American history and literature, British and European history and literature, literary manuscripts, and fine arts. The Harvard University Press is a leading academic publisher of scholarly monographs, and has published more than 4,000 titles, including the Loeb Classical Library. With some 17,000 Puritans migrating to New England by 1620, Harvard was founded by ministers who realized the need for training clergy for the new commonwealth, a "church in the wilderness." it was named for John Harvard, its first benefactor. It received its corporate charter in 1650 and became a university in 1780. "After God had carried us safe to New England, and we ... rear'd convenient places for God's worship ... dreading to leave an illiterate Ministry to the Churches, when our present Ministers shall lie in the Dust ... it pleased God to stir up the heart of one Mr. Harvard, a godly gentleman and a lover of learning ... to give the one half of his estate ... towards the erecting of a college and all his Library." "Let every Student be plainly instructed, and earnestly pressed to consider well, the maine end of his life and studies is, to know God and Jesus Christ which is eternall life, John 17:3"
When the college's first president Henry Dunster abandoned Puritanism in favor of the Baptist faith in 1653, he provoked a controversy that highlighted two distinct approaches to dealing with dissent in the Massachusetts Bay Colony. The colony's Puritan leaders, whose own religion was born of dissent from mainstream Church of England, generally worked for reconciliation with members who questioned matters of Puritan theology but responded much more harshly to outright rejection of Puritanism. Dunster's conflict with the colony's magistrates began when he failed to have his infant son baptized, believing, as a newly converted Baptist, that only adults should be baptized. Efforts to restore Dunster to Puritan orthodoxy failed, and his apostasy proved untenable to colony leaders who had entrusted him, in his job as Harvard's president, to uphold the colony's religious mission. Thus, he represented a threat to the stability of society. Dunster exiled himself in 1654 and moved to nearby Plymouth Colony, where he died in 1658. The early motto of Harvard was Veritas Christo et Ecclesiae, meaning "Truth For Christ and the Church." In the early classes half the graduates became ministers. By the 1760s the proportion was down to 15%. Ten out of the first twelve presidents were also ministers. Systematic theological instruction was inaugurated in 1721 and by 1827 Harvard became a nucleus of theological teaching in New England. The departure of Increase Mather from the presidency in 1701 marked the beginning of a long term struggle between orthodoxy and liberalism. Harvard's first secular president was John Leverett, who began his term in 1708. Leverett left the curriculum largely intact and sought to keep the College independent of the overwhelming influence of any single sect. Seven alumni were killed in the American Revolution. Loyalists were outnumbered seven to one by patriots among the graduates of Harvard and, at the conclusion of the war, found themselves outside of both American and British society, especially lacking business contacts. Patriots, however, were much more mixed in their later careers, with some going on to wealth and others receding into obscurity. John Adams became the second president of the United States. The takeover of Harvard by the Unitarians in 1805 resulted in the secularization of the American college. By 1850 Harvard was the "Unitarian Vatican." The "liberals" (Unitarians) allied themselves with high Federalists and began to create a set of private societies and institutions meant to shore up their cultural and political authority, a movement that prefigured the emergence of the Boston Brahmin class. On the other hand, the theological conservatives used print media to argue for the maintenance of open debate and democratic governance through a diverse public sphere, seeing the liberals' movement as an attempt to create a cultural oligarchy in opposition to Congregationalist tradition and republican political principles. In 1846, the natural history lectures of Louis Agassiz were acclaimed both in New York and on his campus at Harvard College. Agassiz's approach was distinctly idealist and posited Americans' 'participation in the Divine Nature' and the possibility of understanding 'intellectual existences.' Agassiz's perspective on science combined observation with intuition and the assumption that one can grasp the 'divine plan' in all phenomena. When it came to explaining life-forms, Agassiz resorted to matters of shape based on a presumed archetype for his evidence. This dual view of knowledge was in concert with the teachings of Common Sense Realism derived from Scottish philosophers Thomas Reid and Dugald Stewart, whose works were part of the Harvard curriculum at the time. The popularity of Agassiz's efforts to 'soar with Plato' probably also derived from other writings to which Harvard students were exposed, including Platonic treatises by Ralph Cudworth, John Norris, and, in a Romantic vein, Samuel Coleridge. The library records at Harvard reveal that the writings of Plato and his early modern and Romantic followers were almost as regularly read during the 19th century as those of the 'official philosophy' of the more empirical and more deistic Scottish school. Charles W. Eliot, president 1869-1909, eliminated the favored position of Christianity from the curriculum while opening it to student self-direction. While Eliot was the most crucial figure in the secularization of American higher education, he was motivated not by a desire to secularize education, but by Transcendentalist Unitarian convictions. Derived from William Ellery Channing and Ralph Waldo Emerson, these convictions were focused on the dignity and worth of human nature, the right and ability of each person to perceive truth, and the indwelling God in each person. Football, originally organized by students as an extracurricular activity, was banned twice by the university for being a brutal and dangerous sport. However, by the 1880s, football became a dominant force at the college as the alumni became more involved in the sport. In 1882, the faculty formed a three-member athletic committee to oversee all intercollegiate athletics, but, due to increasing student and alumni pressure, the committee was expanded in 1885 to include three student and three alumni members. The alumni's role in the rise and commercialization of football, the leading moneymaker for athletics by the 1880s, was evident in the fundraising for the first steel-reinforced concrete stadium. The class of 1879 donated $100,000 - nearly one-third of the cost - to the construction of the 35,000-seat stadium, which was completed in 1903, with the remainder to be collected from future ticket sales. Over the years, Harvard has grown to include a number of major schools. 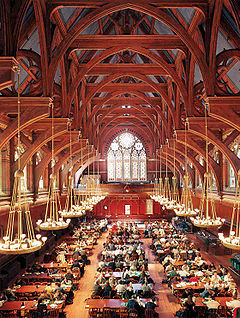 In 2001, Harvard was focused upon as part of a controversy in which high, but allegedly unwarranted, GPA's (Grade Point Averages) were awarded. While in 1940 C-minus was the most common GPA at Harvard, and in 1955 only 15 percent of undergraduates had a GPA of B-plus or higher, in the year 2000, 50% in of all the grades given were As or A-minuses, with just six percent being C-pluses or lower. More than 90 percent of the class of 2001 had earned grade-point averages of B-minus or higher. Observers point out that entering freshmen typically have straight-A averages in high school, SAT scores near 800 in all fields, and have demonstrated an unusual ability to engage in serious study. The days when Harvard included many "Gentleman C" students there for social activities are long gone. Felipe Calderon at Harvard's Panel on Davos Forum, 2013. In a Harvard Crimson article, noted conservative Harvard professor Harvey Mansfield contended that "Grade inflation got started … when professors raised the grades of students protesting the war in Vietnam..." "At that time, too, white professors, imbibing the spirit of the new policies of affirmative action, stopped giving low grades to black students, and to justify or conceal this, also stopped giving low grades to white students." The problem was essentially seen as the predominance of the notion of self-esteem, "in which the purpose of education is to make students feel capable and 'empowered,' and professors should hesitate to pass judgment on what students have learned." Such assertions resulted in no small controversy. Harvard alumnus and author Ross Douthat attributed this problem partly to socioeconomic differences, and noted that "Harvard students are creatively lazy, gifted at working smarter rather than harder", being brilliant largely in their tactics "to achieve a maximal GPA in return for minimal effort." Few people who have taught at Harvard agree with Douthat's notions. Harvard Law School - Article Index. ↑ Harvard at a Glance. Retrieved on November 21, 2012. ↑ 2011 NACUBO-Commonfund Study of Endowments. Retrieved on November 20, 2012. Abelmann, Walter H., ed. The Harvard-MIT Division of Health Sciences and Technology: The First 25 Years, 1970-1995 (2004). 346 pp. Ulrich, Laurel Thatcher, ed. Yards and Gates: Gender in Harvard and Radcliffe History (2004). 337 pp. This page was last modified on 9 April 2019, at 09:46. This page has been accessed 134,734 times.